Full Colour Logos: For logos which are a little complex in design the digital print transfer option is usually best. Multiple Locations: Digital transfers can suit corporate events where multiple sponsors are added to garments. IMAGE: Example of print transfer. A further detailed example can also be seen below for a request we had from Ben Shaws drinks company. Where your catering logo has lots of intricate patterns involved, digital print transfer is usually the best option. For logo cap requests, digital print transfers can effectively be used to help create a bright and sharp looking image. A special type of digital print transfer can be used to decorate sports uniforms with sponsor logos to create a smooth seamless finish . We can help to produce fully custom transfers for your uniform requirements. A badge print effect can be achieved using digital transfer print. Designs featuring high definition colour can be reproduced to print on to t shirts or hoodies using this method. Lets Get Started With Your Digital Print Transfer Request! 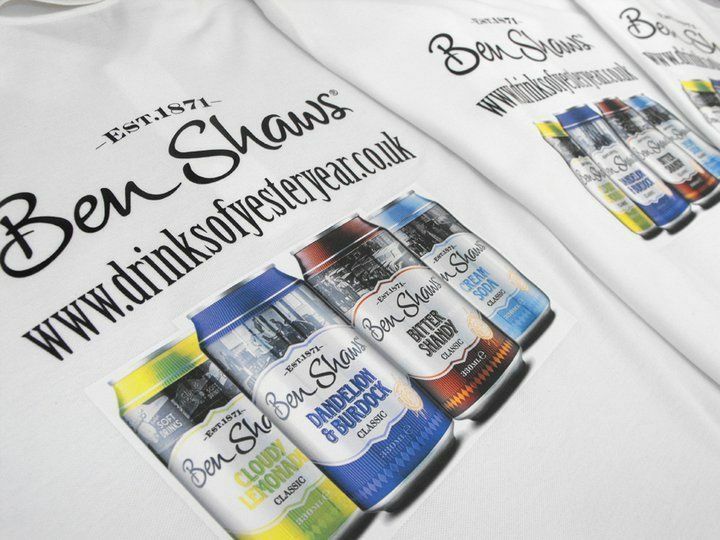 The image you see is an actual close up of a print we did for the Ben Shaws drinks company which features a full colour digital print trasnfer as part of the design onto some high quality t shirts. We can produce various shapes and sizes for you project too.